All transactions are safe and secure with a reliable history in online purchasing behind each of our associates. Buy the Kramer Lobster shirt to own Seinfeld clothing and merchandise. 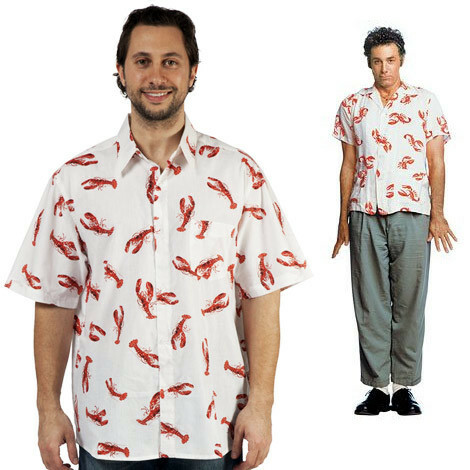 Wear your Kramer Lobster button-up the next time you're watching your favorite Seinfeld episodes. Cosmo Kramer is often seen wearing the cool lobster design on the show. Wear it as part of a Kramer costume. Just don't take Elaine to the party or she might end up uttering the embarrassing dingo quote. The quote refers to the real-life story of an Australian woman accused of murdering her infant daughter. The woman claimed that dingoes ate her baby. Pair this item with a Seinfeld Newman t-shirt. In addition to the Kramer Lobster tee above, browse the Seinfeld Clothing Gallery for more apparel like men's and women's clothes, kids shirts or hoodies.